Vietnamese authorities are expected to finalize the prosecution and trial of 21 serious cases of corruption and economic misconduct in 2018, the Vietnam News Agency has reported. 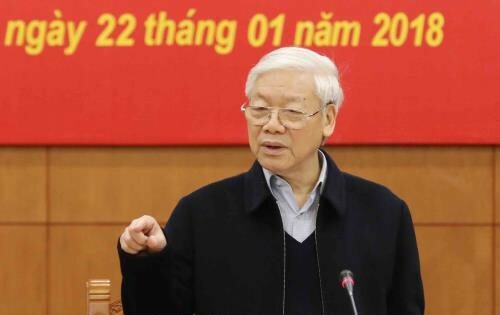 The 13th session of the Central Steering Committee on Corruption Prevention and Control, chaired by General Secretary of the Communist Party of Vietnam Nguyen Phu Trong, was held in Hanoi on Monday. Speaking at the gathering, General Secretary Trong said that the fight against corruption should be intensified this year, with "higher determination, perseverance and efficiency." The Vietnamese Party chief hailed anti-corruption efforts in 2017, which he claimed had made a "good impression and strengthened public trust." “Court trials have become more transparent, democratic, and in accordance with the current law. The sentences have been strict yet very humane,” Trong said. Disciplinary actions were taken at over 300 Party organizations, while more than 18,600 Party members were sanctioned for various infractions, of whom 700 were penalized for corruption and deliberate violations of state regulations. There were, however, several limitations to the process, including the sluggish conclusion of inspections and ineffective anti-corruption methods, the leader continued. There were also issues in coordination between different agencies, which led to problems including the escape of suspects. Regarding tasks set out for 2018, Trong suggested that the Central Steering Committee on Corruption Prevention and Control speed up the refining of mechanisms on socio-economic management and anti-corruption, while launching a campaign to raise public awareness of the law, and filtering out depraved or corrupt personnel, particularly those working in anti-corruption agencies. The General Secretary also said that focus would be directed in 2018 toward finalizing the prosecution and trial of 21 remaining serious cases relating to corruption and economic misconduct by state officials.